The spine is a vital part of the human body’s support system and protecting the extremely important neural elements within as well as being significant muscle and ligament attachment sites. The spine is oriented in such a curved fashion where it acts as a shock absorber as it protects the neural elements. The spinal column begins in the cervical region just under the skull, continues into the thoracic region, and then finally into the low back where the lumbar spine connects to the sacrum, which connects to the pelvis. The upper seven vertebrae are called the cervical spine. They protect the upper spinal cord and protect the exiting nerves to the upper extremities and are muscle attachment sites for the shoulder girdle. The mid back has 12 vertebrae. These are commonly labeled T1 through T12. The lumbar spine has five vertebrae and bears a significant amount of weight comparatively and is a common source of pain. The sacrum and coccyx are made up of nine fused vertebrae that typically form a solid fused region that connect the very strong ligaments to the pelvis. The importance of spinal alignment with pain has been shown that patients who are not well balanced and have significant forward pitching of their spine are often the most debilitated. Normally, the spine is well aligned with a vertical axis to the ground. 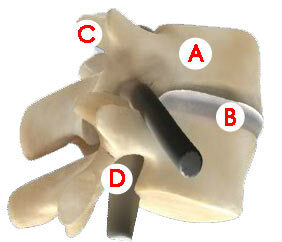 The cervical and lumbar regions have a lordotic curvature, and the thoracic region has a kyphotic curvature. Coupled together, the spine acts as a spring-like shock absorber and can resist injury. A: Vertebrae: The vertebrae of the spine are the bones with complex anatomy that both support the body and protect the nerves. The vertebral body is the square or rectangular-like region in the front of the spine in the region that meets the disc above or below. The spinal canal is the region of the middle of the spine where the spinal cord and nerves travel down toward the arms or legs. The back of the spine includes the lamina, which is a protective armor-like shell as well as muscle attachment sites such as the spinous process that can be visualized and felt under a person’s skin. B: Intervertebral discs: Between the vertebrae are the discs which act as shock absorbers and are a source of both movement and sometimes pain. The outer radial type fibers are strong and resemble the metal reinforcing fibers of a radial tire. The inner gelatinous region is called the nucleus pulposus and has the ability to hold onto water molecules and act like a hydraulic shock. C: Facet joints: In the back of the spine where the vertebrae meet each other, there is a left and a right facet joint. These are small joints and allow movement in all directions and resemble a small joint in the foot or hand. D: Neuroforamen: The openings on the sides of the spine where the individual nerves leave the spinal canal are called neuroforamen. The neuroforamen contain the exiting spinal nerves. Spinal cord and nerves: The spinal cord begins at the base of the brain and continues down to the upper lumbar spine, typically around L2. Along its course, spinal nerves form and leave the spinal cord and travel through the spinal canal through the neuroforamen on their way to either the arms, legs or torso. The bottom of the spinal canal, including most of the lumbar spine, contains only nerve roots that eventually form the lumbosacral plexus and resemble a horse’s tail and are called the cauda equina. The spinal nerves and spinal cord are bathed and protected by a sac of fluid called spinal fluid which is surrounded by a protective layer called the dura. Nerves in the cervical region extend to the upper chest and arms, the thoracic spinal nerves innervate the chest and upper abdomen, and the lumbar nerves travel to the hips, buttocks and legs. The spinal nerves carry electrical signs to and from the brain and may cause pain, numbness, tingling or weakness with disease. Spinal Muscles: The spinal column is a common attachment site of multiple muscles along the body. The spinal muscles act as shock absorbers or suspension cables. Strengthening the muscles may decrease pain.